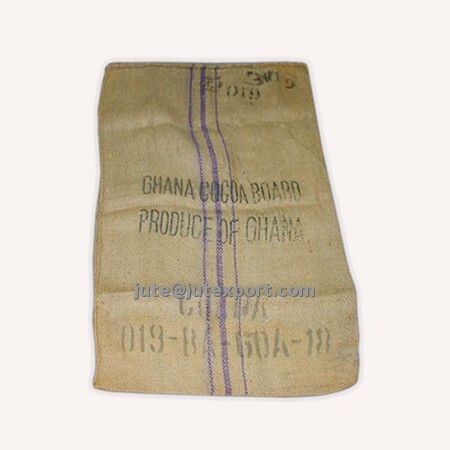 These food grade Jute Bags / Jute Sacks have been used for packaging of exportable Cocoa beans, Coffee beans etc. Vegetable Oil Treated (food grade) Standard B. Twills Jute Bags, Size : 44" x 26.5" (112cm x 68cm), Weight : 2.25Lbs (1020gr), Porter & Shots : 6 x 8, Hemmed at mouth, Overhead Dry Sewn or Herackle Sewn, 3 Blue Stripes, Packed : 300 Pcs per Iron Bound Bale. In order to avoid the mineral contamination in the food stuff these Jute Bags / Jute Sacks have been produced by using Vegetable Oil instead of conventional Jute Batching Oil (Mineral Oil). These Jute Bags are also called Hydro-carbon free Jute Bags.